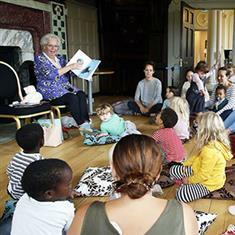 Join us for a storytelling session and make a simple arts craft to take home, suitable for ages 3-4 years. Themes are based on our current exhibition Hidden Treasures: Revealing Broomfield House and Park. Pop into the Dugdale Cafe after the session and purchase refreshments and lunch and don't forget to visit the current exhibition! Children must be accompanied during the activity. Adults do not need to pay. Tickets are limited so booking is recommended. Tickets can be brought at the door but are subject to availability.